Lumigan is a medication used to treat open-angle glaucoma and ocular hypertension in the eye. Signs of glaucoma include increased intraocular pressure (or high eye pressure), blurred vision, and sometimes headache. Increased intraocular pressure is due to a buildup of fluid in the eye. This disease usually develops slowly over time and is more common in older adults. Lumigan, known by its generic name, bimatoprost, is grouped into a class of medications known as prostaglandin analogs. Lumigan effects the eyelash which include increased length and thickness which is usually reversible after treatment. Lumigan mimics the effects of the body’s own mediator compounds called prostamides. Therefore, it is a synthetic form of prostaglandins. The exact mechanism of action is unknown. However, lumigan helps to increase the outflow of aqueous humor, or fluid, from the eye to decrease intraocular pressure. If pressure is not relieved, the risk for blurred vision and eventual blindness is greatly increased. How do I take Lumigan? Lumigan comes as a 0.1% or 0.3% topical ophthalmic solution. It is administered to one or both eyes. The typical dosage is one drop in the affected eyes once daily in the evenings. 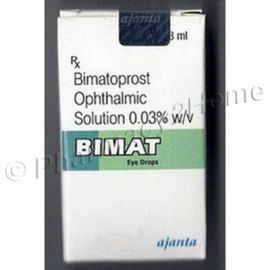 It is not recommended to take more than this directed dose because its effect on intraocular pressure may be decreased. Improvements in intraocular pressure can be seen up to 4 hours after initial administration. Maximum effects are reached within 8 to 12 hours. Lumigan carries the potential for several side effects. These include pigmentation, eyelash changes, intraocular inflammation, macular edema, hypersensitive reactions, or bacterial keratitis (with improper use). Pigmentation of the iris and surrounding eye has been frequently reported with prolonged use of the medication. This effect may be irreversible even after discontinuation. Eyelash changes include increased length and thickness which is usually reversible after treatment. Inflammation of the eye and swelling of the area around the retina are potential concerns as well. Because Lumigan is a solution and administered to a local area, it does not interact with medications taken orally. However, it may interact or alter the effects of other ophthalmic medications. For example, other prostaglandin analogs such as latanoprost and travoprost can negatively compound the effects of Lumigan if taken together. Allow at least 5 minutes between administration of another ophthalmic agent. Can I use Lumigan if I am pregnant or breastfeeding? Lumigan has not been shown to carry any birth defects or miscarriages in pregnant patients. Exact risks are unknown. Therefore, it is important to consult a physician or healthcare provider if you are pregnant or breastfeeding and using this medication. It is recommended to store this medication in a cool dry place. If you wear soft contact lenses, they may become pigmented or discolored from administering Lumigan. It is important to remove contact lens before administration. Contact lenses can be reinserted 15 minutes after administration. Lumigan is an effective medication for the treatment of glaucoma or ocular hypertension. While pigmentation and eyelash changes may be a concern, it is a relatively safe ophthalmic agent. The information provided is for educational purposes only. The use of this medication should be under the supervision of a physician or healthcare provider.